In a world of pink frills and princesses, in a world with 10 Elsas and 5 Annas at every dress-up event, I am so glad my girl chose to be to a strong and diverse character for carnival this year. She had no idea what to dress up as for the upcoming event. She just turned 7. Her dress-up box contains Elsa and Anna costumes, like most little girls around the world these days. She also has a beautiful butterfly outfit, an astronaut one and a few other bits and pieces. 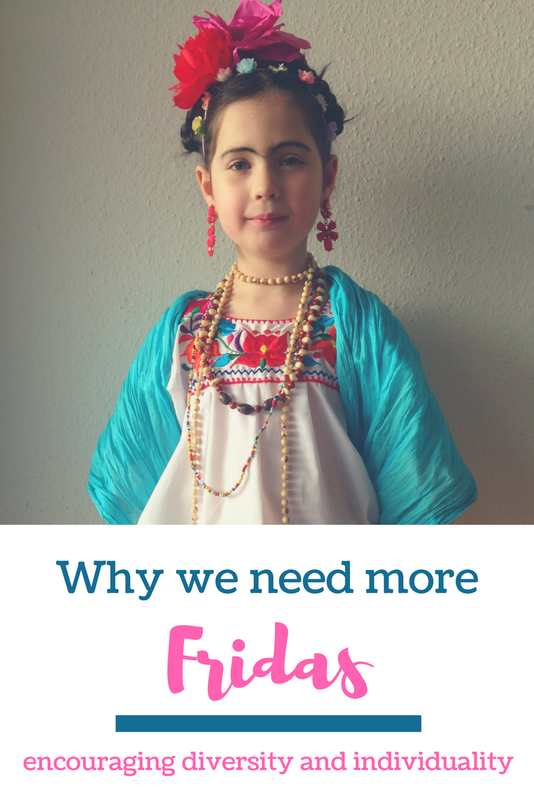 She has never dressed up as Elsa or Anna for carnival. She preferred Jasmine or the butterfly one (a travel memory). I quite liked that, even though I never intervened in her choices. She dressed up as the Arrendale princesses at home when friends came by to play. She felt there were too many Elsas. I agree (even though I never said it). There is, of course, nothing wrong with Elsa and Anna. They are lovely princesses and every little girl wants to be one of them at some point in their life. Don't we all love to play the princess once in a while, dress up, be glamorous, be admired? Go on, admit it! Yet, there are many more women in the world (real or not) that make amazing role models for girls: artists, scientists, writers, etc. 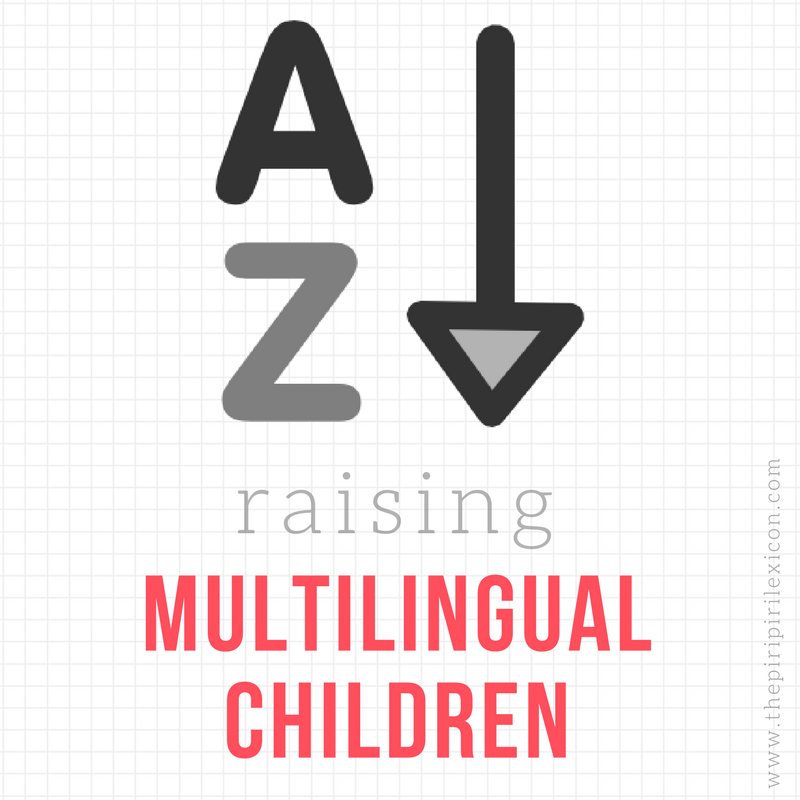 They may not be as famous or as glamorous but they are equally important, if not more. So, time came this year to pick a costume. The only choice left, as far as she was concerned, was the astronaut. She loves space. Since we came back from the Kennedy Space Centre last year, she has been reading and eagerly learning about space. Yet, she didn't feel like dressing up as an astronaut. Fair enough. We had just bought a book about strong women that changed the world (see links below). I suggested we look into it to maybe find someone she liked. And there we had it. She immediately became enthused by her story, her bravery and her beautiful drawings. 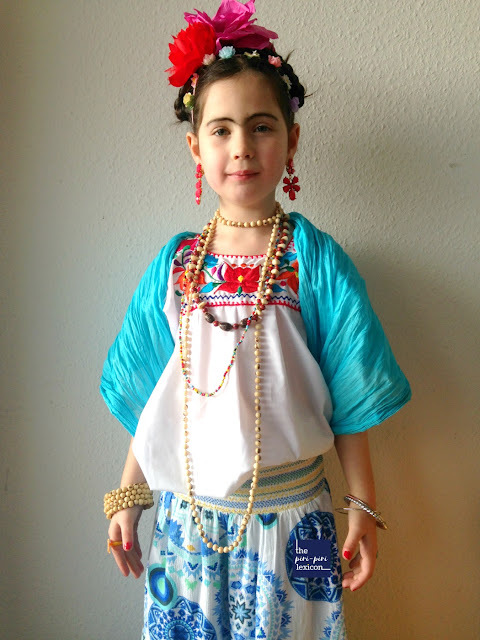 We used this fabulous lesson about Friday Kahlo from Kid World Citizen as inspiration. She learnt the number of paintings she had painted. She wanted to see those watermelons (her last painting) again and again. She was fascinated by the fact that she was painting in her bed. She thought it was very cool that some of her painting were in Paris (where we could go and see them next time we were in town). She loved the pretzel in her hair (a German touch?). And she had learnt a little about Mexico as Papa had told her stories from his trip. In a world, where everyone is looking at their belly button (paraphrasing our school director), we need more diversity. We need to celebrate differences. We need to highlight those strong people who have the courage to be themselves and stand for change. We need children who have the courage to stand up and be different to be celebrated. Praised. At the very least, not laughed at. Not put down or told they should stick to being like everyone else. Of course, not everyone wants to be different. Many just one to blend in. And that is ok too. But please, as parents we should not make fun of those who dare to be different. Because yes, a mum will laugh and make negative comments. My girl had once refused to wear a t-shirt that two other girls had at kindergarten. She said they were copying everything and was fed up. So, we changed t-shirt once again. One of the other girls' mum made fun of my girl for not wanting to be the same. I was surprised. I was shocked. I was sad. 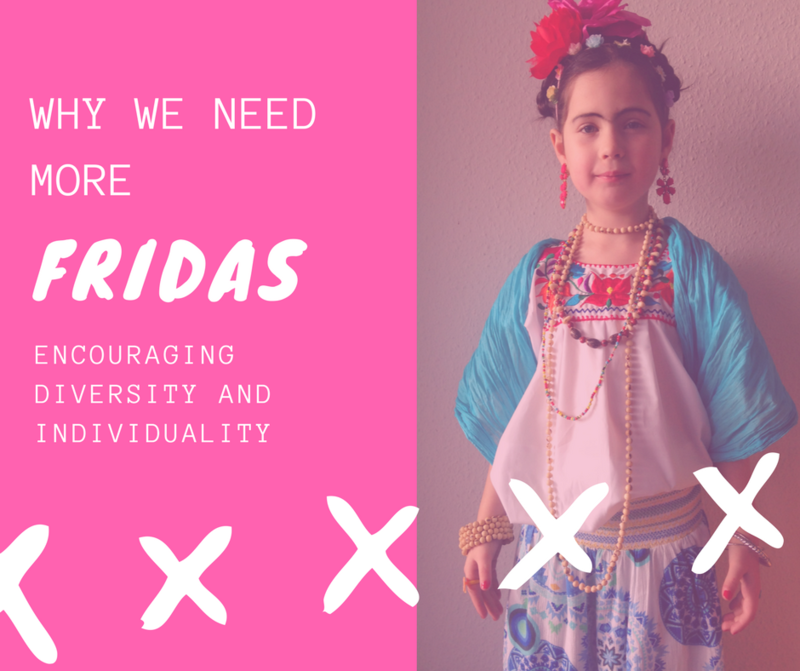 Diversity, uniqueness and individuality should be celebrated. We are all different. Whether it is our looks, our clothes, our bodies, it doesn't matter. We are different. Wouldn't the world be boring if we were all the same? 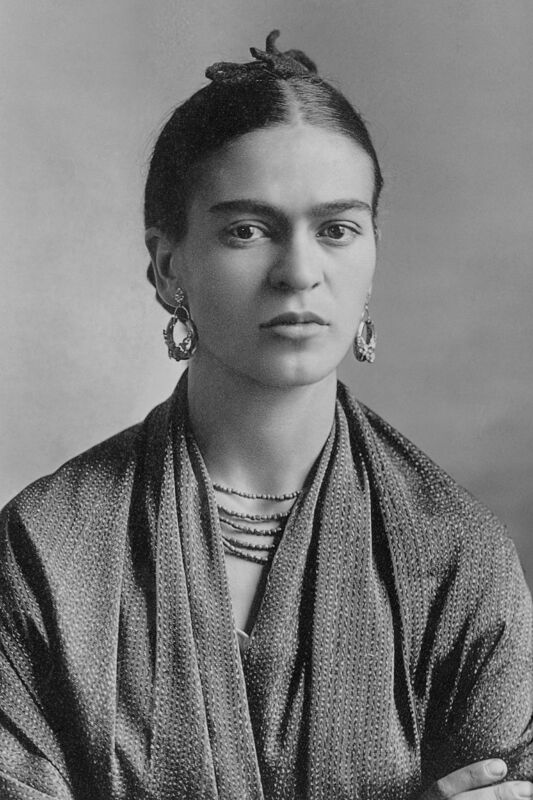 Anyway, back to our Frida. I just needed to make it happen. Papa had been to Mexico recently and had brought back a few bits and pieces. 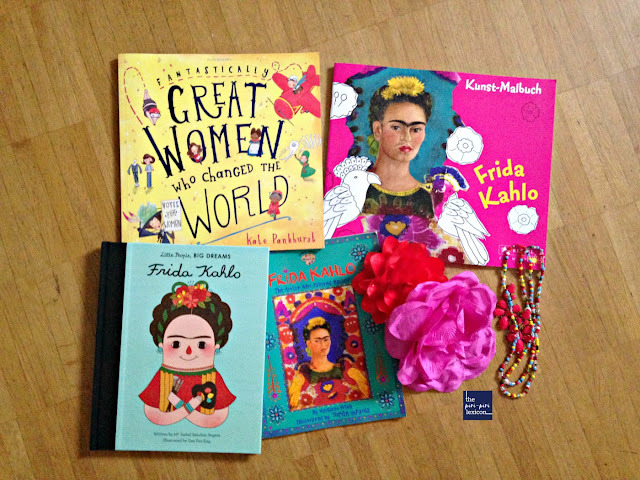 We also got a couple of books to learn about Frida so she could tell her story (see the list below). We put it all together with borrowed necklaces, earrings and flowers. And then came the eyebrows. She had noticed them. She knew why Frida was drawing them that way. She kind of liked it but hesitated the night before despite finding the overall trial tool "amazing". I pushed a tiny bit and she was happy to have them. I picked her up from school today. Proud mama. She had made it. She went with it and most importantly loved it. She told me how much she loved the costume and how much people had commented (positively) about it and how many girls had gone: "wow!". She was proud of herself. I was too. But then she told me how some of her classmates had laughed when she had entered the classroom. She was unsure whether it was the eyebrows. She thought it was. She mentioned she went to the bathroom at one point and thought about removing them. But she chose not to. She told me she thought she could do it. So, I praised her bravery. Her bravery for having the guts to go to school as someone new, someone different, someone very few people know (amongst European kids at least). And I praised her bravery for having kept the eyebrows and having explained their story and meaning. Her reply? "oh yes. I had not thought about it that way." Love my strong 7-year-old. If you want to learn more about this incredible woman, I highly recommend these books. Tested and approved by our 7-year-old. (If you purchase through one of these links, I make a small commission but it costs you nothing extra. Merci). This post contains affiliate links. If you click on some of the links and make a purchase, I receive a small contribution at no extra cost to you. Thank you for your support. Love this idea! Thanks for writing this post! Fantastic costume idea! !She looks fab!May have to take a look at that book about Fantastically Great Women...it looks interesting! Loved this post! Brought back sweet memories of my daughter when she was also 7 (she is 12 now) went to school dressed as Don Quijote (we live in Hong Kong, so not very known here). She still has the home made outfit stored away and I am not allowed to throw it out. I love this, she looks adorable. Congratulations!